Where did you get your upholstery? Maybe you received your preferred piece of furniture from a relative that may have passed away. That couch may be of sentimental value to you. Our staff here at Tile and Grout Cleaning Katy are professionals at cleaning home upholstery. Perhaps, you are in college and can barely buy necessities, much less brand new things to put into your dorm. You might be the type of person who has always worked hard for what you want in life. Knowing how big of an investment that furniture is in the home, we advise that you shouldn’t be so quick to make the decision to throw them away. Upholstery steam cleaners of Tile and Grout Cleaning Katy are the premier and most affordable company in the Katy area. Most used furniture comes with stains and underlying smells. We clean sofa stains with the gentle organic biodegradable products that you will find to be gentle on your health as well as your furniture. There are many professional furniture cleaning companies in Katy, so how do you pick which one? Well, we allow our customer reviews and our previous work to speak for itself. It is not surprising that many of our new clients have been referred by previous customers. This is because of the outstanding customer service experience that we give to all of our clients. Our pricing is reasonable and can fit into any budget. Don’t throw away that recliner that you bought less than a year ago because of stains and smells. It is easy to think that throwing out worn furniture is the answer when it is obvious that it cannot fit into a washing machine. However, Tile Grout Cleaning Katy is here to save the day and save you lots of money as well. 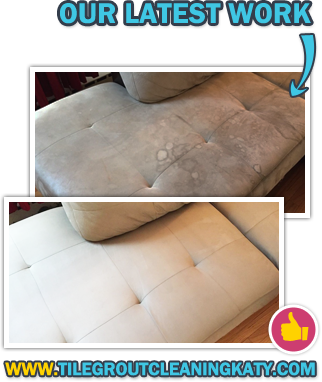 We offer a consultation and we can target problem areas such as urine, stains, and highly dirty areas on the couch. Many companies tend to try to cover up a smell. However, with Tile Grout Cleaning Katy, we are here to get deeper than the mere surface. Once we use our hot water extraction equipment to bring your furniture back to life, we also will provide a protectant sealant to reduce the risk of future damages. It is very important to have your furniture cleaned at least once annually. We have many return customers because we take our time and get the job done right the first time. We never rush or damage your belongings with rushed carelessness. Give one of our friendly operators a call today to get you set up for a consultation. This is one of the best investments that you will make. Have you tried to clean upholstery fabrics with those products that you have found on the shelves at local stores? Many of them do not work. Time and money are usually the most precious things to us. Don’t put either of them to waste. Give the professional couch cleaners of Tile and Grout Cleaning Katy a call today to discuss which cleaning packaging would best fit your needs.